If you're planning a baby shower for a friend or family member, you're in for an exciting and complex experience. From the invitations to the games, there are lots of essential elements to consider. Having a plan and a timeline for when to do each task will help make your shower run smoothly, and keep the entire experience stress-free for you and the mom-to-be. To have a really well-planned shower, you'll need about ten weeks of time to get things in order. You can do things faster if you need to, but it may add to your stress level. Starting about two and a half months before the big date, you'll need to do the following tasks. Avoid holiday weekends, since many people have other plans. Talk to some of the most important guests, including the family of the future parents and any special friends. Choose a date that they can make it. Consider the needs of out-of-town guests who will have to travel to the event. You'll also need to set a time for the shower. This may be a start time only, or you may prefer to also include the time the party will end. Allow time for guests to arrive, play games, eat and drink, and watch the mom-to-be open her gifts. Most showers take at least two or three hours. You can host a shower almost anywhere, although baby shower etiquette dictates it shouldn't be in the home of the parents-to-be. You can host the shower in your home, which is an easy, affordable choice. You could also rent a space at a local park, or make a deal with a restaurant to use a back room. There's no wrong answer, as long as the space will fit the number of people you plan to invite. Host a coworker-only baby shower for a mom you work with. This is a great option for moms who work in large offices and are close to their office mates. Have a co-ed baby shower, and invite the dad as well. This is becoming more common, and many moms-to-be enjoy sharing the spotlight with their partners. The guest of honor may prefer a family-only baby shower if she doesn't need a lot of items or wants to keep the gathering intimate. It's also important to discuss whether children should come to the shower. Ask what the guest of honor prefers, and go with that choice. Once you've determined who will be going, ask the guest of honor or her family for a list of names and addresses. You'll need this information to send out invitations in a few weeks. At about eight weeks before the party, there are a few other tasks that need your attention. An evite is a modern choice for a very informal baby shower. You can create the invitation online, which will save you money on paper and postage. A free printable baby shower invitation is another affordable option. In this case, you'll only need to pay printing costs and postage. You can save money on designer baby shower invitations and matching thank you cards that you can print yourself at home from a DIY site like The Printable Baby. You can also buy custom printed invitations from sites like Shutterfly, Tiny Prints, and Pear Tree Greetings. 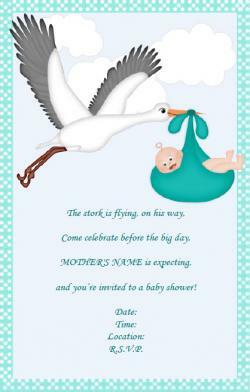 If you need help downloading the stork baby shower invitation, check out these helpful tips. You don't have to have a pick a theme for the shower, but having one can make choosing decorations and deciding on food a bit easier. There are lots of baby shower themes to consider, from children's book showers to diaper showers. As the shower approaches, there are a few more items to tackle. Make sure you remember the following. It's time to send out the invitations. This gives guests a chance to block off the date on their calendars and send their regrets if they are unable to attend. Most baby showers include a small gift for each of the guests who attend. You don't have to spend a fortune on baby shower favors. There are lots of ideas, from edible gifts, to candles and potpourri. You can buy the favors or make them yourself. You may want to pick food that coordinates with your theme. If you're hosting the shower in your home, making the food yourself can be enjoyable and affordable. Find fun recipes to find dishes that will be a hit. For a more casual gathering, a baby shower buffet is a great idea. This lets guests serve themselves at their leisure and makes the event easier for the host. If you're hosting the shower at a restaurant, pick a few items off the menu that you know will delight your guests. Don't forget to consider what guests will be drinking. In general, most showers don't include alcohol, since the mom-to-be can't drink. However, a great punch is always a hit. A cake is another important element at any baby shower. You can make a cake, in which case you have plenty of time to pick a design. 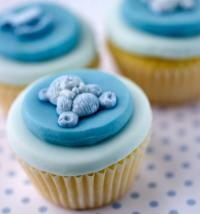 View pictures of easy baby shower cakes and simple baby shower cupcake ideas to help you get inspired. If you'll be ordering the cake from a bakery, you'll need to get that order in right away. Bakeries can get very busy during certain times of the year, so planning and ordering your cake now is a wise move. Get inspired with pictures of baby shower cakes, and if you find one you like, take the picture with you to the bakery. They can often emulate your favorite design. The same goes for unique and complex baby shower cupcakes. Now that the shower is only a month away, you'll have a few additional tasks to handle. 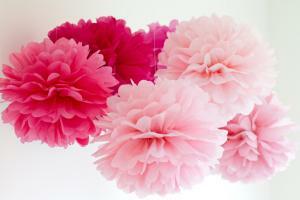 Save money and get creative by making some baby shower decorations. You don't have to be a master crafter to tackle these projects. Use baby shower signs to draw attention to the party. These can include yard signs, door signs, and banners. Choose gender-specific decorations if the mom-to-be is sharing the baby's gender. There are great ideas for girl baby shower decorations, as well as sweet baby boy shower decorations. Don't forget to purchase or make table decorations for the shower. This should include any paper products guests will need for eating and drinking. Games are another important element of any shower. They can help break the ice and make guests feel comfortable and engaged in the party. 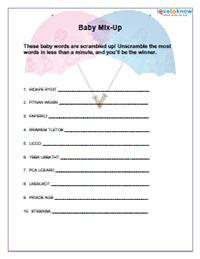 There are lots of great baby shower games to choose from, including diaper games, mad libs, and free printable games. Don't forget to pick up a few prizes for the winners of these games. During the week before the shower, you'll mostly be getting last-minute things in order. Remember these tasks. If you'll be hosting the shower, you can start cleaning your home during the final week of preparation. If you're having it at a park, stop by the day before to make sure all trash is picked up from the party area. This is the time to prepare the foods you'll be having at your event. If you're doing the cooking, it helps to spread the grocery shopping and dish preparation out during the week before the actual event. Make a list of everything you need to do and tackle things in the order they need to happen. Guests arrive and have hors d'oeuvres or punch. After everyone is there, play one or two games. Take a break to eat a meal and/or have the cake. Have the mom-to-be open the gifts. Pass out party favors and say good-bye to guests. If you haven't heard from some of the people on the guest list, this is a good time to track down their RSVPs. This will help you figure out how much seating and food you'll need for the event. On the day of the shower, you'll be pretty busy handling last-minute tasks. You'll need to do the following. If you ordered the cake or any party food, it's time to pick those items up. You can assign this task to a trusted friend if you are able. Put out your decorations to make the party space special. Don't forget to include a table for gifts, as well as a space for eating. You'll need seating for everyone who plans to come. Planning a baby shower doesn't have to be complex if you stay organized. Simply do the tasks you need to when they need to be done, and you'll have a fun and stress-free party that will honor the mom-to-be.